The rooms and suites at The Savoy offer stylish and contemporary Egypt hotel accommodations, superbly furnished with private balconies and terraces offering excellent views. Each room and suite is adorned with high quality fixtures, luxurious décor, and marble and wood design details. Sea view hotel rooms featuring king or twin beds. Occupancy: 2 Adults and 1 Child under 12 years old. Pool view rooms with plush King or Twin beds. Garden views and your choice of King or Twin beds with occupancy for two adults and two children under 12 years old. Three single beds in a 50 m2 room featuring beautiful garden views. Spacious suites featuring king beds and occupancy for two adults and two children. 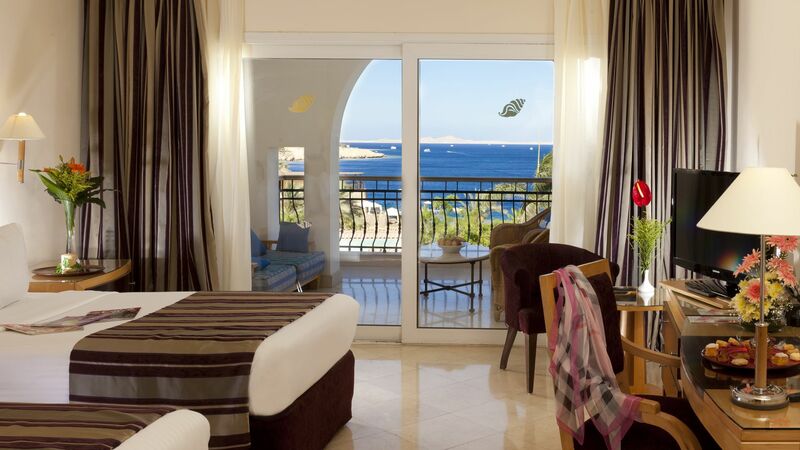 Large, 200 m2 suite featuring a king bed with LCD and bathroom overlooking the Red Sea. Featuring twin beds and occupancy for two adults, with one rollaway or one crib available upon request.